The amount of energy and capital wasted in these fights hinders the recovery of Puerto Rico. Instead, I want to highlight a point where the JSF and the President of the Senate do agree, to see if they can work as a team to help carry it forward. I refer to a Citizen Identity Platform and this coming Wednesday, June 6th we will hold our fifth “Government Blockchain Association Meetup” where we will address the issue of identity management. 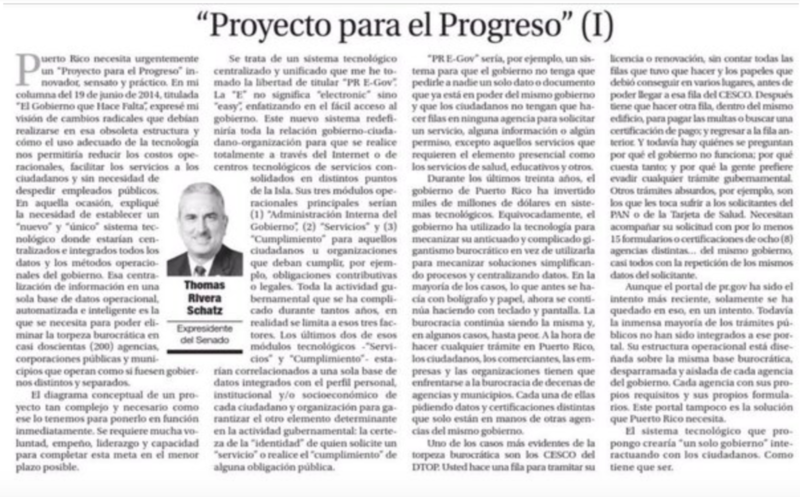 Rivera Schatz wrote in favor of this in 2014, titled “Proyecto para el Progreso”, where he mentions the need to establish a “new” and “unique” technological system where all data and government methods would be centralized and integrated. The important thing is to understand the proposed objective, and I quote “to eliminate the bureaucratic clumsiness in almost two hundred (200) agencies, public corporations and municipalities that operate as if they were separate governments.” Schatz has the right idea, although imprecise in its execution plan. On the other hand, the Fiscal Board included this as one of the 18 recommendations in its annual report, and I quote: “Develop a digital platform to centralize services to citizens in collaboration with the US Digital Service.” It seems that the Board and Rivera Schatz agree to facilitate the delivery of services digitally. Now they have to agree on how to support and execute this task. Governments and companies manage and share a significant amount of information from their users, with cross-correlation of everything from viewing habits to shopping, to where people are during the day and with whom they associate. A system of “self-sovereign identity“, where people and companies can store their own identity data on their own devices and provide them efficiently to those who need to validate them, without relying on a central repository of identity data, can offer great benefits of efficiency, savings, and enhanced security, in addition to fostering the development of new services. In the United Kingdom, this system is called Gov.UK Verify and they maintain an active blog to inform about its constant evolution and development. This Wednesday we will openly discuss how this type of system has been designed and implemented in other jurisdictions and how using blockchain as an identity management solution allows the user to take control of their own data. We will also discuss alternatives to implementation in Puerto Rico and the importance in ensuring such implementation protects people from the increasing control of those who hold power, which may or may not have the best interests of the individual.